The optimizer decided to drop down just a bit at quarterback this week, instead of going with Tom Brady or Russell Wilson. Cam Newton is in a good spot, as Green Bay ranks 20th in DVOA against the pass, and have allowed the 7th most fantasy points per game to opposing quarterbacks over the last five weeks. Buffalo is allowing the most fantasy points per game to opposing running backs, and Kenyan Drake is going to get another heavy workload this week. He is going to likely be one of the more popular value plays, but is worth a look in all formats. Dede Westbrook is also the other popular value this week. Houston has allowed the 8th most fantasy points per game to opposing wideouts, and Westbrook is averaging 1.20 fantasy points per target. Christian McCaffrey doesn't make much sense for me on FanDuel with the .5 PPR scoring. It isn't a bad matchup, but I rather play Alex Collins at $6,600, or yes, even Carlos Hyde at $6,900. Adam Thielen and Antonio Brown are both solid pay options this week, and with the majority of value at running back, it is easy to fit both it. New England is 26th in DVOA against WR1s, while the Bengals are 13th. Evan Engram is a contrarian option as Zach Ertz and Rob Gronkowski should get a majority of the ownership this week. Engram should continue to see 7-8 targets, and hit value in even a subpar offense. 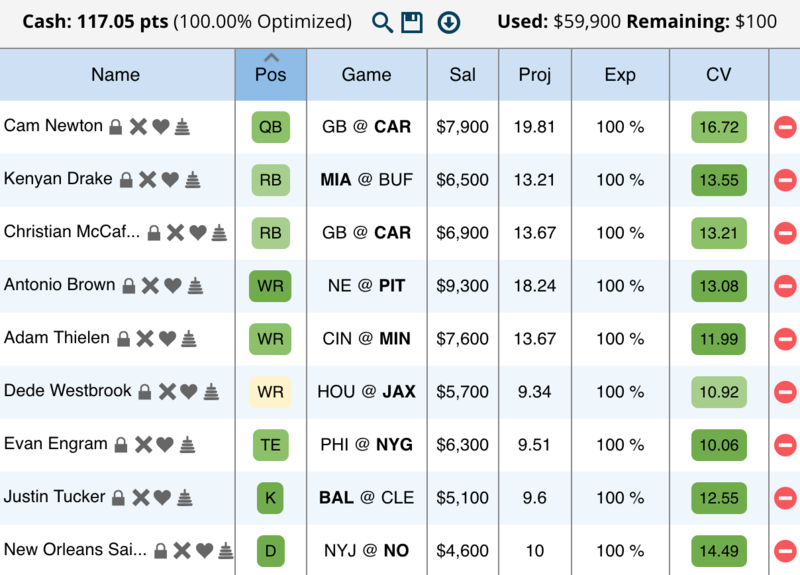 New Orleans is the top points per dollar defense on FanDuel this week. They are home taking on a Jets team without Josh McCown. At $4,600 they are an easy plug and play.